Amusingly serendipitous, or not, tonight I could trade my desire for this film for a fresh episode of Grantchester, which is a TV show based on the Sydney Chambers books such as the one I was reading a year ago today. I'm putting this here because. But also will then download on old comp. to remove dust and scratches with PS, then replace. Okay, sorta. This kept morphing into one idea, then another. First, a huge young portrait you can see larger if you click on it. 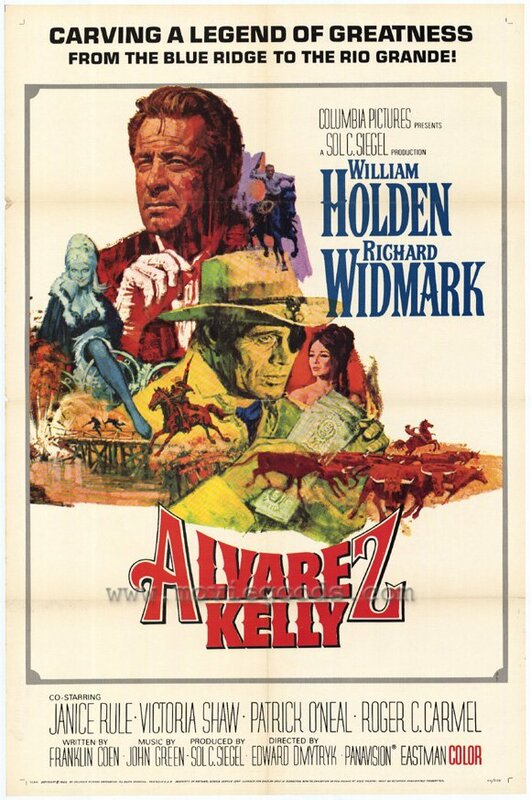 Three from Alvarez Kelly, 1966. And this brings us to five, but I feel I owe something to dear old lostie, who's been patient with me about DINAO, and also is tweeting the most hilarious European vacation travelogue ever, so here's a comparison, and anyone who cares to may choose which Holden chest they prefer. I much prefer the real thing to the shaved version, but it was considered a more youthful look. I resent Picnic kinda like I resent Sabrina, except backwards, maybe. Humphrey Bogart as Linus Larrabee was absurd. David could have run me over with his car and I'd have stayed with him over that guy. But if Joseph Cotten had played Linus, as he did on Broadway, I'd be satisfied. In Picnic, though, my boyfriend Bill is kinda like Bogart as Linus; he did a great job but it was all wrong.